Author of the Amazon best-selling book, Color Your Message, Lisa boasts a wealth of knowledge from more than two decades as a business development leader. She enjoys speaking to diverse audiences of teens, millennials, and seasoned business leaders, educating them on how to execute a plan of action to achieve their vision and success. 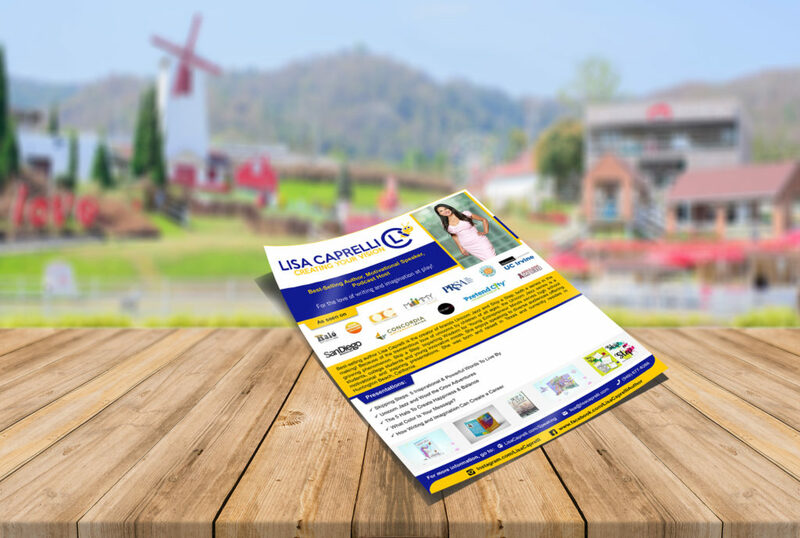 Lisa Caprelli is a marketing strategy consultant, author, branding and team building expert. She works to help businesses—from small to medium-sized businesses to large corporations —achieve success and maintain relevance in our rapidly evolving world by understanding how to use today’s technology with a top-notch team. Interested in having a speaker like Lisa Caprelli present at your school, organization or meeting? Contact us today for resources and her crowd pleasing topics! To request Lisa Caprelli's Speaker one sheet and topics available, contact us by filling out the information on the form above. Sensational Story Time (1:30pm): Gather around as Children’s Author Lisa Caprelli reads her story, Unicorn Jazz. Unicorn Jazz discovers how difficult it can be to make new friends, but thanks to her mother she learns how to celebrate her uniqueness and meets Woof the Crow, who helps her realize her talent. Presented Unicorn Jazz to Mr. O’s classroom of 3rd graders along with singer/songwriter, Thanecha Anderson. This was a great classroom of engaged students who gave us thank you letters as well! This was a blast to be interviewed by 9 year old entrepreneur Neva. This show will be aired at a future time. Lisa talks about her new books and why she transitioned into being an author, along with her joy for helping other authors. Having had the privilege of researching and interviewing over 150 CEO’s and entrepreneurs in all walks of life I now want to share with you some great stories. I began my quest in interviewing what makes an individual influential and purposeful and how communication can change lives! There are 11 powerful words I have identified that have influenced the lives and decisions that have created meaningful lives to powerful leaders. Learn what works and what does not. Marketing is what will bring you new and returning customers. Discover the methods Lisa uses to leverage technology with your product or service. This talk helps entrepreneurs, leaders, business executives and CEO's get their greatest work into the world utilizing digital marketing tools, social media and technology right at your fingertips! Despite the prevalence of online video content channels, people are still negligent in harvesting this digital bonanza of free digital real estate. Simple videos correctly entitled and described, can yield inbound marketing leads for years to come. Google’s sister company YouTube is a powerful ally that should not be ignored when identifying your digital marketing plan. As early as 2012 that the web had transitioned from text-based to video-based. YouTube is well established as the second most popular search engine behind Google. More social media sites are integrating video daily. Because videos can boost your web presence and drive consumer engagement, it is important to make sure that people can find your videos when they search online. Learn how to make your videos engaging, search engine friendly, and boost your online SEO relevancy. Online videos have become a very useful method for sharing information. Not only is YouTube the second-largest search engine after Google, but it also has a massive reach across social networking sites. People watch more and more YouTube Videos every day, and they share such videos on Twitter, Facebook, Google Plus each minute. These social engagement numbers demonstrate the huge reach that videos naturally have. Because videos can boost your web presence and drive consumer engagement, it’s important to make sure that people can find your videos when they search online. Learn how to make your videos search engine friendly. Speaking Topic: The Internet Is Video Centric, Is Your Marketing? Motivation Empowerment and Speaking Presentation to 180 high school students, drawing from my book, Skip a Step and its journal. The Five Hats" and viewpoints I write about when it comes to balancing friendship, family, career, connection and adventure! We discussed how to get out of depression or unfortunate life circumstances and how to find happiness in areas that will serve you well! Tables were turned as I interviewed host Denis Murphy from The Happy Mindset for my research on the "5 HATS!"